Police drivers will have more legal protection if they are involved in a crash, in a bid to tackle criminals on mopeds, as part of Home Office plans. New proposals aim to smash the "myth" that officers cannot pursue riders who are not wearing helmets. "Criminals must not think they can get away with a crime by riding or driving in a certain way," policing minister Nick Hurd said. The Police Federation, which has called for the changes, welcomed the reforms. But the federation's roads policing lead Tim Rogers urged government to "act quickly to prevent more officers suffering unnecessary and often mendacious prosecutions". The reforms - which would affect forces in England and Wales - follow concerns among officers that they risk prosecution for careless or dangerous driving if they chase criminals at high speed, particularly those on mopeds and motorcycles. Under current rules, any motorist - including police officers - who fails to drive in a "competent and careful" manner can be prosecuted for careless or dangerous driving. Use our tool to see how badly your neighbourhood is affected (London only). Submit postcode to see results. The Police Federation argues this deters some officers from pursuing suspects - because they are worried they will be investigated and charged if they have to break the speed limit, jump red lights or drive on the wrong side of the road. 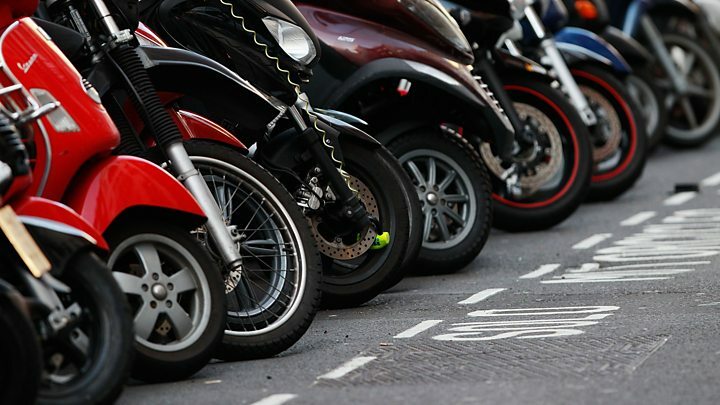 The overhaul of the law follows a surge in crimes involving scooters and motorbikes in the last three years, particularly in London. Common moped crimes include snatching phones, but some people have been slashed with knives and weapons by drivers too. Will the police call off a chase if a suspect removes their helmet? There's no specific rule which forces the police from calling off a pursuit. Instead it's up to police forces to issue guidance to officers. The Home Office consultation says "we have seen how criminals' perception of well-intentioned local guidance around pursuing motorcycle riders not wearing crash helmets has contributed to an increase in motorcycle-related crime, particularly in London". The Metropolitan Police said that if a suspect removes their helmet they can still pursue, while "taking advice from the pursuit tactical adviser". Joy Merriam, a solicitor advocate, told Reality Check it comes down to a value judgement: "If the police pursue someone who is not wearing a helmet they have to weigh up the risk of the suspect getting injured. Officers have to consider things like: how built up the area is, whether the speed is appropriate to the conditions and the risk to pedestrians." Under the government's proposals, published on the first day of the annual conference of the Police Federation, rules would be changed to take into account police drivers' high level of training. Police would instead be subject to a separate test requiring an officer to drive in a way that is necessary and proportionate to the circumstances. "Our proposed changes will make sure that skilled police drivers who follow their rigorous training are protected, while ensuring the minority of officers who do cross the line are robustly held to account," Policing Minister Nick Hurd said. The rules will also make clear that a moped or motorcycle rider who does not wear a helmet is responsible for their own decision to drive dangerously. In 2016-17 there were about 10,000 police pursuits and 500,000 blue-light responses in England and Wales.